There is then creative reading as well as creative writing. When the mind is braced by labor and invention, the page of whatever book we read becomes luminous with manifold allusion. We’ve been reading as much as possible over the last few months and want to invite you to send us more suggestions! Below is a list of 10 books that have inspired us, energized us, and made us think deeply since the beginning of the project. If you’ve read a book that fits the spirit of Kern and Burn, tweet the title at us and we’ll check it out. We love books, and the more we read, the better we’ll write. In case you are one of the few people that didn’t see Frank Chimero’s amazing new site yesterday. His library is perfect. Honest and fun business advice from the founders of 37 Signals. Behance’s Scott Belsky shares stories from creatives who know how to execute. Derek Sivers, the founder of CD-Baby, encourages readers to make things that help others and says we can do anything we want. A collection of relevant, thoughtful essays from the Walker Art Center’s graphic design show. 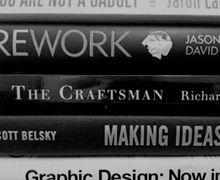 Steven Heller and Lita Talarico profile designers who have turned graphic design into products for the market. Andy McMillan, Jez Burrows, and Carolyn Wood collaborated to make this series about the “Whys” of web design. Sennet’s book asks philosophical questions about what it means to be a maker, and to make things well. Blake Mycoskie shares his inspiration, choices, and journey building Tom’s Shoes. Jaron Lanier questions if Web 2.0 interconnectivity is really as beneficial as we think it is. Jessica Livingston shares collected interviews from today’s leading startup founders. Tweet your suggestions at us here.